>>> résumé = "knows Python"
Python is a powerful tool in the Data Scientist’s toolbox. A quick search on LinkedIn will support this hypothesis (if you had any doubts). At SAP we appreciate that Python is not just a nice-to-have, but an expectation for modern technology platforms and from SAP HANA 2.0 (Express Edition Support Package 03, Revision 033), a Python Client API will provide integration for Data Scientist’s to accelerate and enhance their work. For the first part of this blog series, I will cover the HANA DataFrame and the second part will cover the Machine Learning API. Picture this… you’ve recently set up a team of highly skilled Data Scientists. 5+ years experience in IT? Check. PhD in Astrophysics, Mathematics, Neuroscience etc…? Check. *sigh*. Great. You’re surely on the path to success. You assign the team a task of building a fraud detection system using a database of 50 billion rows across 10 tables. A robust prototype algorithm must be presented in a months time. What could go wrong? You have the skills, you have the data… but all too often Data Science is seen as more of an analysis task than a process. When Data Science is appreciated as a process, performance and deployment are paramount and this is the difference between a “Data Science Project”, and building industrial machine learning. The biggest performance hurdle comes from the data, and when dealing with the plethora of channels and data sources available… this equates to a LOT of data. When using Python IDE’s such as Jupyter, the data is persisted to the client and this means more processing time, which directly converts into a drop of productivity for your prized unicorns/Data Scientists. This is where the SAP HANA DataFrame can add real value to a Data Scientist’s work. An SAP HANA DataFrame provides a way to view the data stored in SAP HANA without containing any of the physical data. The Machine Learning API’s make use of an SAP HANA DataFrame as input for training and scoring purposes. An SAP HANA DataFrame hides the underlying SQL statement, providing users with a Python interface to SAP HANA data. By reducing data transfer, this massively improves productivity and speed. This means faster development cycles, rapid prototyping and more flexibility. No need to re-train or upskill Data Scientist’s with new tools. Use Pythonic syntax that they are comfortable and familiar with. Open-ness. By combining open source packages with the Python API, we are not restricting Data Scientists to use specific tools. We are opening our technology to the Data Science world. For detailed instructions on how to set up the Python Client API, see this tutorial. Now, I will give you some details on how to use the API. To use an SAP HANA DataFrame you must create the “ConnectionContext” object, then use the methods provided in the library for creating an SAP HANA dataframe. The DataFrame is only usable while the “ConnectionContext” is open, and is inaccessible once the connection is closed. # Then create the HANA dataframe (df) and point to the table. The first select statement is generated by the head() method. This query is then run by a cursor() and returned with a fetchall() method. The returned results are handled by the collect() method and copied into a Pandas DataFrame, along with the names of the columns. DataFrame Manipulations: casting columns into a new type, dropping columns, filling null values, joining dataframes, sorting dataframes, renaming columns, etc. Descriptive Functions: statistics relating to the data, showing distinct values, creating DataFrame with top n values, etc. DataFrame Transformations: copying an SAP HANA DataFrame to a Pandas DataFrame and materialize a DataFrame to a table. MEDIAN("ITEM_WEIGHT") AS "median" FROM (SELECT * FROM "SCHEMA". "TABLE") AS "DT_0"
MEDIAN("ITEM_VISIBILITY") AS "median" FROM (SELECT * FROM "SCHEMA". "TABLE") AS "DT_0"
MEDIAN("ITEM_MRP") AS "median" FROM (SELECT * FROM "SCHEMA". "TABLE") AS "DT_0"
MEDIAN("OUTLET_ESTABLISHMENT_YEAR") AS "median" FROM (SELECT * FROM "SCHEMA". "TABLE") AS "DT_0"
The first statement generates basic statistics for the columns. The second statement generates 25, 50 and 75 percentile calculations for each column. Finally, both statements are assigned an alias and called in a final select statement, bringing the results together into one table. For a full list of DataFrame methods, see the documentation site here. The SAP HANA DataFrame is a great way to improve productivity of Data Scientists by drastically reducing data transfer. 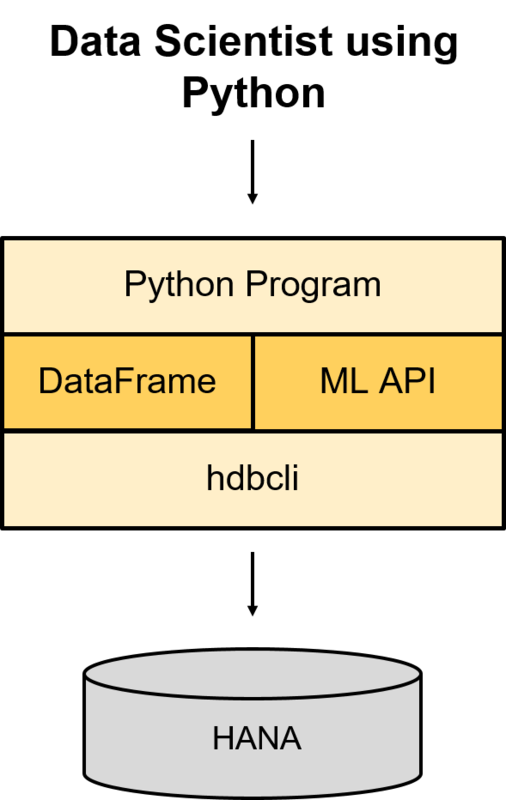 The DataFrame has a collection of methods that can further enhance a Data Scientists work and they can use this in combination with their favourite Python packages. When training machine learning models, by shifting the focus from analysis to process, the Python Client API can help to convert a “Data Science Project” into an industrial machine learning project. Download HANA Express Edition today and get started! What do you think of the SAP HANA DataFrame? Please feel free to share, comment, like and follow! Excellent overview of this exciting integration with Python. This integration opens up HANA to a whole new World of users. Thanks Dean, absolutely. SAP are opening up their Data Science platform to give the flexibility of using proprietary and open source technology together seamlessly! Great content Arun. I would definitely try your second link in appendix. Sometimes installing and doing something with sap components takes much more than planned. Thanks Anand. Absolutely, the two blogs that I link to are highly recommended to read. I’ll be happy to help anyone with the setup of the Python API, feel free to reach out. Hi Arun, the link to the documentation site is broken. Could you provide an update? Hi Rene, it should work now – let me know if it doesn’t.